At the heart of our seasonal reverence, there is always light. In the dim light of midwinter we gather around a fire. My children tell me their own creation story of winter’s sleepy sun. It is her time to rest and the small brave fire remains beside us, a comfort in our sun’s absence… We know winter happens because of the tilt of the earth, and we seek the fire because it warms us. Our winter fires provide one small spark of the sun’s fire. And the light of the sun not only gives us warmth, but color. We are cool blue in winter like the twilight that edges our days and we dream of the season that will fill our world with yellow particles of light like the pollen of the sun. Many of us hold a glowing beeswax candle on special days during a festival or to create a ritual space. In his bee lecture, Rudolph Steiner compares beeswax to the material of our human body, the worker bees of the hive to the blood coursing through us, and the hexagonal shapes of the honeycomb to our cells. Structures of living organisms are mirrored throughout the natural world and beeswax reminds us of our relationship to the earth. The sweet smell of it when we light a candle is a hint of the warm comfort a bee might find in her small sacred capsule. Each cell of the honeycomb is a hexagon. It is the perfect shape, the one that holds together in strength and efficiency. There is no waste in a system of cells that fit together at perfect angles, a necessary consideration when a honeybee must consume about eight ounces of honey to create one ounce of wax. The worker bees create their city of hexagons in tandem, each bee following her inherent plan of geometric repetition. Each cell of the honeycomb may hold the golden honey, converted nectar from meadow flowers; or the precious life that will someday gather more honey, the bee’s larva. So the worker bee creates these small spaces as vessels of life, whether she is aware of this significant purpose or not. We can watch the honey bee create these small sanctuaries, her working body warming the cell as she forms it. This is her part in the circle of life and she puts her heart into her work. If you wish to draw the honey bee’s symmetrical hexagon shape, you may start with the hexagram, the star that is made by overlapping two equilateral triangles. Connect the points of that perfect star to make the most precise hexagon. 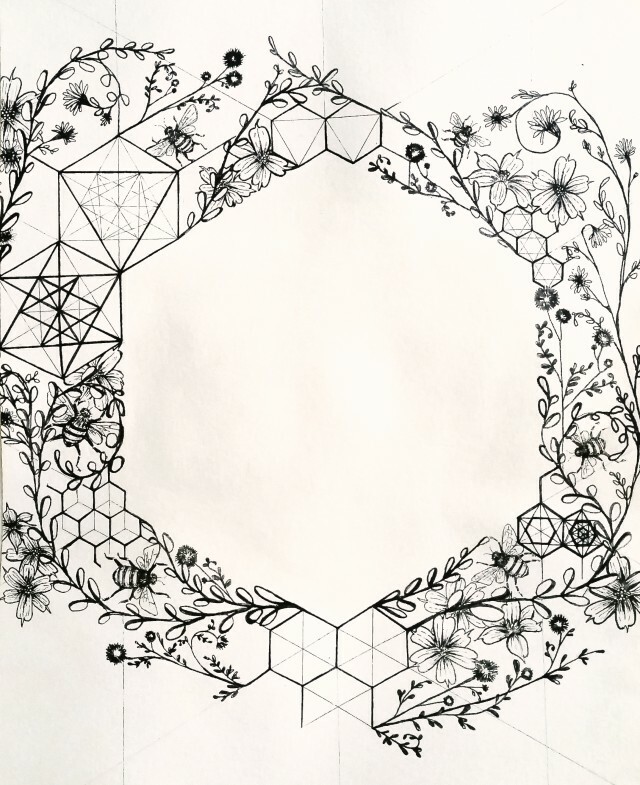 The star inside the hexagon holds the poetry of the honey bee’s sacred forms and their relationship to the spiritual body of our human world. The hexagram, the six-pointed star, is the shape associated with Anahata, the heart chakra. It is the Star of David, it is associated with the Kabbalistic tree of life, and it is one symbol associated with the Christian Son of God. The hexagram is significant in Tibetan Buddhism, in astrology, in occult magic and Wicca practices. Here, once again, is nature’s pattern of repetition through time and space and meaning. The honey bee sings while she works and we hear her spirit song. Her hum is spun into the fiber of summer so that we associate this vibrational sound with brilliant rays of sunlight that make us stop and close our eyes and feel the sun on our faces. It is no wonder the wildflowers turn their faces toward the sun and are graced by the light healing touch of the gentle honey bee. This entry was posted in G E N E R A L and tagged bee, bees, hexagon.